This 13-inch coaster brook trout was found in one of the experimental rivers while conducting surveys. Photo: Troy Zorn, Michigan DNR. 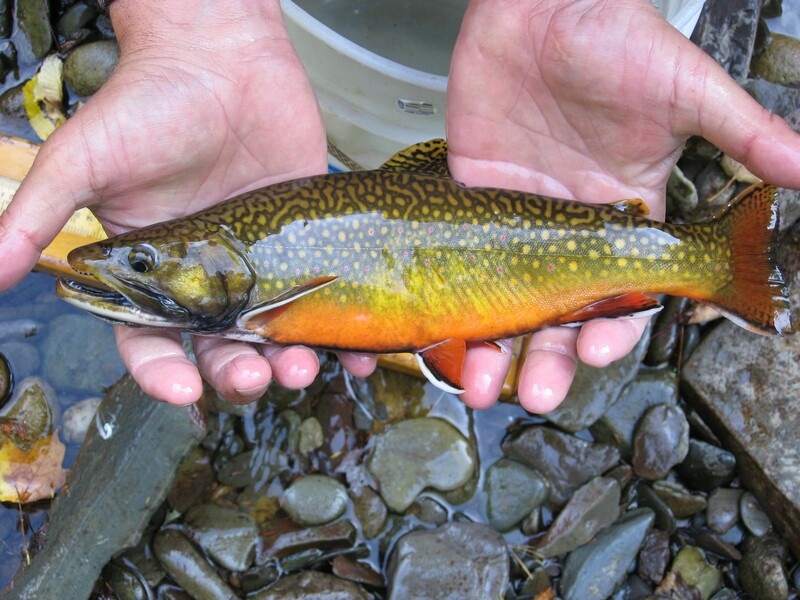 Trout anglers headed out for the 2015 fishing season can now keep 7-inch brook trout caught on any of Michigan’s Type 4 trout streams. The Natural Resources Commission approved a new regulation in April reducing the minimum brook trout size limit from eight inches to seven inches on those waters. The change affects 130 Type 4 streams where the brook trout MSL will now be consistent with Type 1 streams, the majority of trout waters in Michigan. It was one of several changes approved by the commission for trout waters. The NRC also gave the nod to more restrictive brook trout regulations for nine Upper Peninsula streams where efforts are underway to restore coaster brook trout populations. It approved establishing “adfluvial brook trout restoration areas” on these Marquette, Houghton and Baraga county rivers: Big Garlic, Big Huron, Little Huron, Pilgrim, Ravine, Silver and Slate. The Portage/Torch Lake system in Houghton County is also included. Anglers fishing those waters can catch and keep brook trout from the last Saturday in April to September 30, but the minimum size limit for brook trout, splake and lake trout was increased to 20-inches, with daily possession limit of one. Anglers have been able to catch five, eight-inch brook trout until now. The restrictive rules were modeled after those tried in Minnesota, which protected brook trout and allowed them to grow to trophy size. Coasters were once abundant in Upper Peninsula streams. They are lake-run brook trout that can grow to 25-inches. They disappeared by the late 1800’s due to overfishing, logging and habitat loss, according to a Great Lakes Fishery Commission’s plan for rehabilitating Lake Superior brook trout. Michigan and other Lake Superior states and provinces have been working to restore the populations. Splake and lake trout were included in the regulation to simplify enforcement, according to Zorn. Neither species typically swims into the streams. Anglers can also keep 10 brook trout on three new waters that were added to the state’s list of Upper Peninsula experimental brook trout streams. The daily limit for brook trout on each was doubled from five per day to 10 per day. The streams are part of the ongoing DNR Fisheries Division experiment to determine how 10 brook trout limits affect Upper Peninsula brook trout populations and fishing pressure. Those waters are: Bryan Creek in Marquette and Dickinson counties; Presque Isle River and its tributaries in Gogebic County; and Rock River and its tributaries in Alger County. This entry was posted in Uncategorized and tagged Brook Trout, Conservation, DNR, Fish, Fishing, Michigan Department of Natural Resources, Rivers, Trout. Bookmark the permalink. My father started me out as a little brook trout bum in 1955. The fond memories of thick creek brush, mosquitoes, and muck are precious. Good article. Thanks Tom. Brookies are one of my favorites as well. I just don’t get north enough to enjoy them as much as I’d like.